“The Syrian Experience As Art”, an exhibition organized by Castleton University, Rutland, Vermont, USA. – Christine Price Gallery, Castleton, Vermont, USA, August 29 – October 14, 2016. – The Castleton Gallery Annex, Rutland, Vermont, USA, September, 2016 – January, 2017. A year after his announcement that the town would welcome 100 Syrian refugees, Rutland Mayor Chris Louras asked a favor of Castleton University professor emeritus William T. Ramage. He hoped that Ramage, who officially retired from his academic duties in 2007, would curate an exhibition of Syrian art. The show would not only serve as a welcome gesture to the city’s incoming Syrians, but also provide current residents with some cultural reference points. Ramage told Louras he’d do it, and secured funding from the university to boot. “The Syrian Experience as Art” opened at the Castleton University Bank Gallery (in the former Lake Sunapee Bank in downtown Rutland) on Sunday, September 18. A secondary arm of the show, featuring some of the same works, opened at the school’s Christine Price Gallery in Castleton in late August. 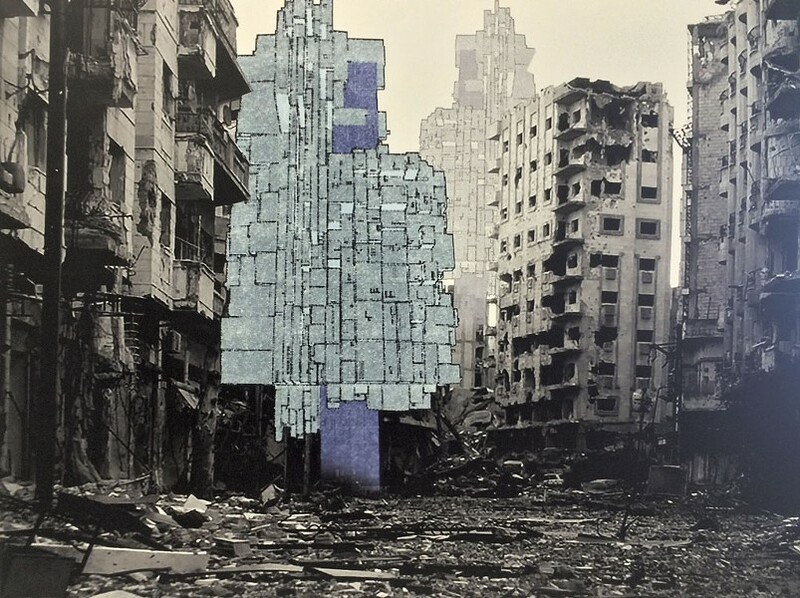 The two-venue exhibition features work by 12 Syrian artists from multiple countries. The show began even as political tensions coursed through Rutland’s population of approximately 16,500 (according to the 2010 census). Two community groups represent the poles of local attitudes toward resettlement: the pro-resettlement Rutland Welcomes and the generally anti-resettlement Rutland First. Ramage noted that, to date, no one has retaliated against the exhibition. Youssef’s experience speaks acutely to the relative ease with which images, and the ideas within them, can flow globally even when humans cannot. One work in the show, by Damascus-based Julie Nakazi, references this theme with allusions to social media, contemporary Syrian art and politics and the clash of East and West. 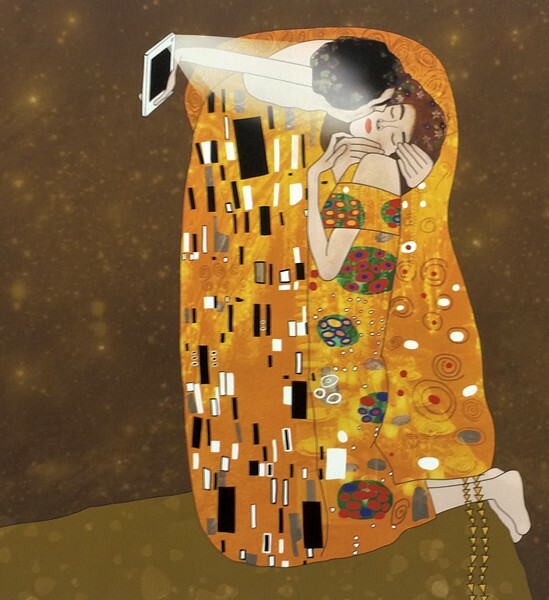 In “no privacy,” Nakazi renders Austrian painter Gustav Klimt’s “The Kiss” in a cartoonish style; the female subject holds out an iPad for a mid-kiss selfie. In 2013, Dubai-based Syrian artist Tammam Azzam’s work “Freedom Graffiti” went viral. That work digitally superimposes “The Kiss” on Syrian rubble. It was part of Azzam’s project “The Syrian Museum,” which paired iconic Western works with scenes of the country’s destruction. Nakazi’s work echoes the power underlying Azzam’s original appropriation, while also making a universally recognizable comment about privacy, identity and iconography in the digital age. Not all of these works address the Syrian crisis — least of all Youssef’s. 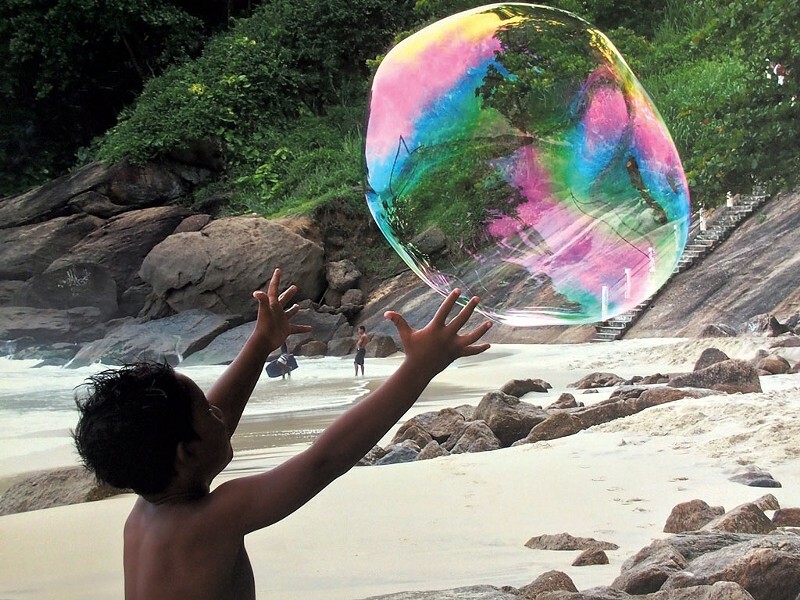 The artist and organizer takes photographs of large bubbles whose iridescent surfaces reflect the landscape surrounding them. (Some of his work is available at Stowe’s West Branch Gallery & Sculpture Park.) Ramage noted that the images might be shown again later in the children’s section of the Rutland Free Library. Hoping to tour the show, Ramage has been in touch with Burlington architect Bren Alvarez, who curates Burlington’s Flynndog gallery. In the meantime, the bank exhibition will remain on view through January.